What is it? A procedural side-scrolling dungeon crawler. It seems like a simple job. Travel to a nearby town, rescue a few villagers who’ve gotten themselves lost in the local coal mine. But when your rookie knight arrives in the snowy hamlet of Karthas, he learns the true horror of what has happened. Something terrible has been awakened in those deep mines—something evil—and it’s a good thing you brought your sword. Chasm is a challenging side-scrolling platformer in the tried and tested Metroid mould, with games such as Castlevania, Zelda, and Spelunky also hard-coded into its DNA. It's like a Metroidvania best of, relying on no particular gimmick or hook, which is a little concerning at first, because, honestly, it doesn't really do anything that exciting with the genre. The titular chasm is the complex, maze-like, procedurally generated network of tunnels that yawns beneath Karthas, from the dusty coal mine just below the surface, to the ancient dungeons and arcane temples hidden in the depths. The feeling of plunging into a mysterious, dangerous world, of being an intruder, is a powerful one. You can’t help but wonder what lies at the very bottom of the labyrinth, but the deeper you go, the more dangerous it gets. Enemies on the first few floors are easy to outsmart and kill. Rats, skeletons, bats, kobolds. The usual suspects. Later foes, however, are fast and deadly, requiring patience and precision to slay. But they’re always predictable in some way, and learning their patterns is where the skill in Chasm lies. Memorising and dodging a volley of deadly fireballs from a flying skeleton demon, then sneaking through a brief hole in its defences to deal the killing blow, is immensely satisfying. But your fumbling early attempts to learn those patterns can be frustrating. When you die in Chasm you’re kicked brutally back to the main menu and forced to reload a save. Getting back into the game only takes a few seconds, but it feels like a lifetime when you’ve died at a boss for the tenth time and want to just get it over with. And save points are often far apart, which means repeatedly retracing your steps can repetitive. But whenever I’m annoyed by something in Chasm, I’m won back over by how wonderful it feels to play. Everything you do is brilliantly snappy and precise, and it’s clear developer Bit Kid spent considerable time tweaking the controls to make them feel just right. Your move set is basic at first, but as you explore the chasm you unlock moves such as grabbing ledges, sliding, and double-jumping that steadily increase the complexity of the level design. There’s a procedural element to Chasm, meaning every playthrough is different. But it doesn’t feel like a load of machine-generated tunnels stuck clumsily together. I never once got the sense that I was playing something dreamed up by a computer, and if you told me my particular version of the map was hand-crafted by the developer, I’d have believed you. And if you like a particular layout, you can save the seed to play it again or share with friends. In the spirit of Metroid, keeping a mental map of the world, in conjunction with a simple map that’s filled in as you explore, is essential. Thankfully there’s also a cleverly-designed teleport system that makes quickly returning to Karthas to resupply and talk to any villagers you’ve rescued fairly easy. Opening these shortcuts up is a huge relief, because it means you can save, and refill your mana before diving into the next, more difficult level of the chasm. And so your journey continues, down, down, ever down, fighting bosses and minibosses, uncovering secrets, unlocking new abilities, finding new weapons. Weapons radically change how Chasm plays. A short, stubby knife means you have to get uncomfortably close to enemies to attack, but it does lot of damage. The satisfying crack of the Castlevania-inspired whip gives you a bit of distance. The club is slow to swing, but hits hard. Sometimes if I was struggling with a boss, switching to another weapon would suddenly make it much easier, which adds a nice, simple layer of strategy to the game. There are some light RPG elements too, with enemies spewing out XP orbs that boost your health, strength, and so on. But otherwise it’s a deeply old-fashioned game—by design, of course—and that means it can be quite gruelling at times. You’ll have to repeat sections over and over again to master them, and I found my patience wearing thin more than once. 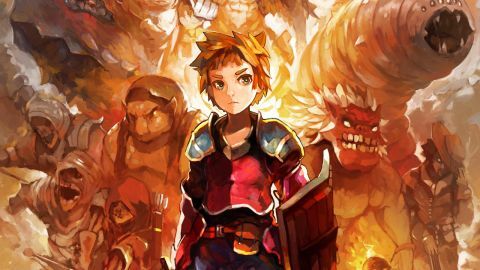 But that’s part of the deal in these kinds of games, and if it’s a quality, polished Metroidvania adventure you want, you can’t do much better than Chasm, even if it does play it a little safe.